NEW YORK (AP) -- At least for one day, drivers in the New York region on Saturday seemed to be getting a break from spending hours in gas lines after Superstorm Sandy. Around New York City, they still waited longer than usual at stations. But the lines that stretched a dozen Manhattan blocks earlier in the week at some stations were far shorter. Many were closed — for lack of fuel or taking a break. In Brooklyn, drivers waited about 20 minutes at most in blocklong lines — much less than in previous days. 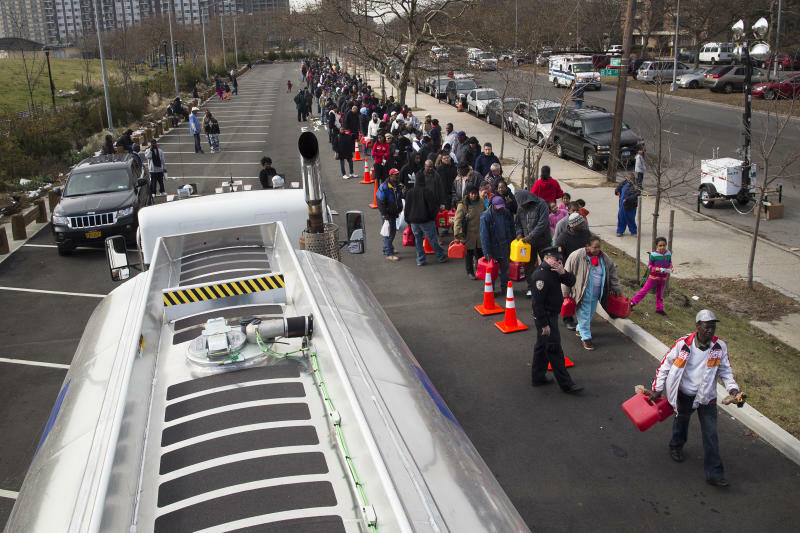 But on Staten Island, the few open stations were busier, with about 20 cars lined up on one street amid stalled traffic. No one knows exactly what will happen in the coming week as commuters and businesses look for fuel to get back to work. The gas rationing announced earlier this week — the first in the nation's largest city since the 1970s Arab oil embargo — is forcing motorists to alternate days they line up at stations based on whether their license plate ends with odd or even numbers. In New Jersey, state-imposed gas limits continued in 12 of 21 counties. The rationing based on license plate numbers will be evaluated to see how much longer it's needed, according to Michael Drewniak, a spokesman for Gov. Chris Christie. The restrictions, coupled with power restoration, have mitigated the long waits that drivers endured at service stations just after the storm, said Sal Risalvato, executive director of the New Jersey Gasoline, Convenience Store and Automotive Association. "It may take another week or so before it gets back to normal," he said.